Sometimes a lady needs a sassy work outfit that says smart but stylish. Sometimes a lady needs a lovely party frock that says let’s boogie. Other times a lady needs a needs a flowy summer top made of fluoro yellow dotted swiss. This is one of these times. It’s official peeps- I have won summer. BWAH HA HA! This pattern is the Alice dress and top from Tessuti Fabrics. It’s a smock style number with a yoke and what I like to call sleeve wingalings. Seriously. These things are crazy awesome. All hail the wingalings! Now I am a lady who knows a smock frock will not work for me so I went with top option rather than the dress. As I am also lazy I decided to print this pattern at home rather than drive the ten minutes to Officeworks to print on A0. Word of the wise- printing at home and only wanting to cut the smock is HARD because the pattern is so dang big. Thankfully Elizabeth kindly compiled the pages you need to print for the top and you can check these here. I knocked together two versions of this sucker super quickly. The fabric for the first version is a crazy white voile from Spotlight. But what caught my attention was the fluoro yellow dots, woven in almost like dotted swiss, that assault your eyeballs. The fabric is really lovely and soft and feels great on. It is transparent as all get out so I lined it in a white poplin for the yoke. My midriff, however, is flying breezy and free! The second fabric is something pretty magical. This is the Snowflake linen from Tessuti. I first saw this on their Instagram feed and had bought a metre of it within ten minutes thinking I could make some sweet summer shorts or a skirt. Then I saw Rachel’s Alice top made from this and I totally had to style stalk. If you want a treat for your eyes check out Rach’s version. She has styled it gorgeously! Sorry for style stalking, lovely lady! The sizing for this top put me in the Large but after reading a few reviews I went down to the Medium and it worked a treat. 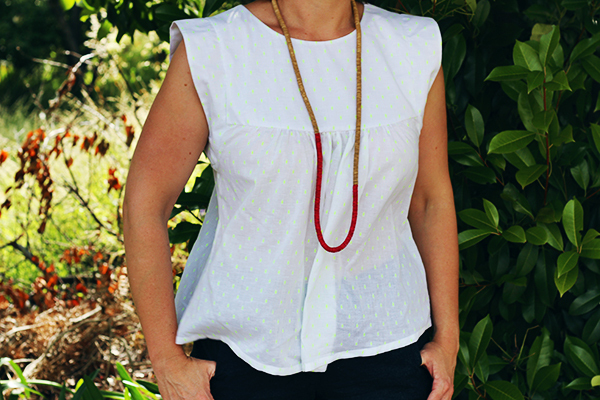 10cm was also taken off the length as the whole tunic vibe is not my bag and I prefer my tops to finish at my hipbone. After the kaftan I think I’m wanting to get a bit short and sassy! I’d like to say construction was easy but let’s real talk: the first attempt at the yoke stretched out like a saggy baggy elephant. The stay stitching I did around the neckline didn’t hold up and the fluoro voile stretched horrifically. Ugh. If I didn’t love the colour so much it would have ended up in the bin. Luckily there was enough to recut the yoke pieces and this time I very carefully stay stitched stay tape to both the shell and lining and thankfully it worked. Otherwise, the construction was pretty sweet and easy and this only took me a couple of hours from start to finish. There is nothing exciting to report except the instructions were clear and illustrated with photos. Yahoo! Relatively quick construction. If you don’t count the yoke “test run”. Oops. The breezy shape. This is perfect for the festive season. I hide all kinds of cake under this top. And I mean literally. Not consumed cakes. Cakes ninja-ed from a dessert table BWAH HA HA! The sleeve wings. I feel like some kind of 80s superhero. OMG what can my power be? Cartwheels of doom? Breakdance fighting? LAZORZ?!?!?! I actually have nothing. This is such a sweet and easy make. Nice work, Tessuti! I’ll be honest- after making these up I was super sceptical about how they looked on. This is a lady used to things with limited ease. But then the snowflake top rocked it out at a work function and the fluoro top, paired with Iris shorts and Chuck Taylors, made a fantastic Saturday afternoon pottering ensemble. It may not be my regular silhouette but this lady is getting crazy and adventurous for summer. If only the temperature actually would warm up! Hee her wingalings! That’s an awesome term. Love the fabric! I’ve been considering making this top but was unsure of how it would suit. After seeing yours I think I’ll firmly add it to the list. They are totally 80s superhero shoulder wings though, right?! It’s such a tops summer number- it would be great for the QLD humidity! I made an Alice today. It’s all love for this pattern from me too. I’m already scheming more! Ohhh I can’t wait to see it! Did you go the top or frock? I bet it is fierce! 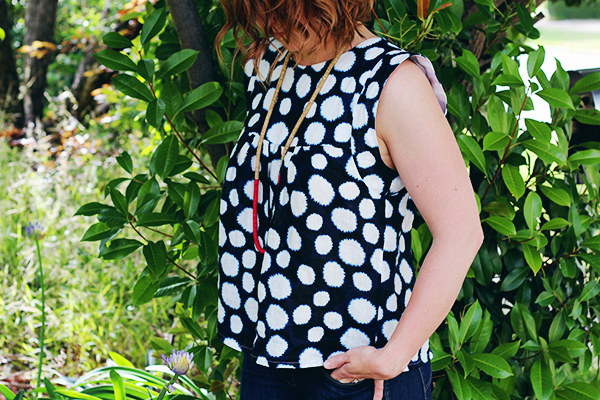 I made the top with a contrast front yoke (of course I did!). It will be blogged by Xmas. Sneak peak on Instagram. You look great Amanda! 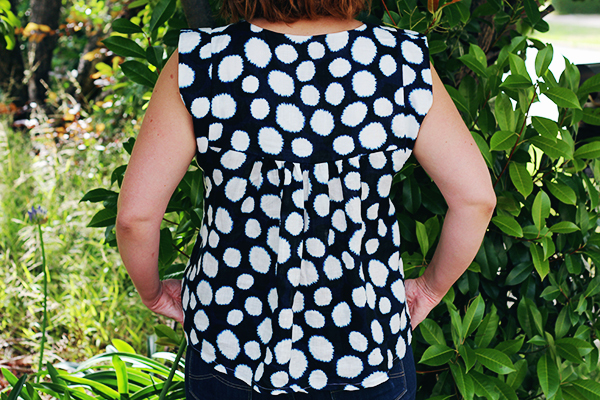 You rock an Alice – and you know I love the snowflake linen in Alice too! Spotlight has been coming up with the goods lately, huh?! And Tessuti as well- love their recent pattern releases! Two smashing tops here! Roll on summer, woohoo! Seriously awesome Summer styling. You’re certainly on a ‘quality’ roll. *hat tip* My thanks, Ms Maria! We can were our rad summer makes in January when we catch up! Thank ye, Mel! This is so comfy and flowy and it was crazy to go from no makes in November to two in one night. Bwah ha ha! Efficiency! Oooh pretty tops! I adore especially the flouro-swiss one. I can imagine it perfectly because I saw that stuff too in Spotlight, though it never occurred to me to buy it. Silly me! You totally need the fuoro swiss! It is so wrong it is all kinds of right 😀 I totally thought of this as a bit of a nightie top too- go with it I say! This would be so comfy in the heat and humidity of Darwin! Sadly I think the fluoro-swiss is long gone. Happily I have a whooooooooooooole lot of other fabric that would work nicely in this style all queuing up to be sewn. And yep about the style being perfect for here. Nothing wrong with wearing nighties in disguise, I say. I think it’s suddenly on my sewing list. Woohooo! Now which of my many fabrics to choose ??? Noooo! Can’t wait to see what stash gem you pick! Made it! Just got to put some pretty trim on it then photos and stuff. It’s a nightie with a yoked neckline. And on the kitchen ben- er I mean cutting table another one, exactly this square-yoked style, is about to be cut out. And I may just happen to have another nightie top with a round yoke in the cutting-queue. Can’t go overboard with pretty tops like yours in this weather. PLEEEZE let the monsoon come. Pleeeeeeze!!! I’m loving this style on you and I love the sleeve thingamajigs! How wide was your fabric? The pattern says 1.4m of 112cm wide. Did you eek it out or was your fabric 140 wide? This is such a breezy summer thang- I love it. I feel the urge to sing “We’re all going on a summer holiday” whenever I wear it. Because I’m sassy like that teehee! Love it! What a great pattern. The white one is so pretty and summery…an absolute classic. But I LOVE the spotty linen – just so striking. I so regret missing that fabric now! Isn’t it the best? I wish I had grabbed more!! This is one of my hands-down favorite silhouettes and you are killin it! Good call on the fabs. *hat tip* Many thanks, milady! I am a total convert to flawy awesomeness- so much comfort! Gorgeous tops! I know how you feel about the ease around the stomach being out of comfort zone. I felt the same way at first and I’ve worn my top heaps and I’ll probably be making another one in white similar to your stunning version. Glad you found my printing info helpful haha. I so wish Tessuti and other pattern companies would provide which pages to print for which version. It’s so the perfect Christmas noms top! Do eeeet! 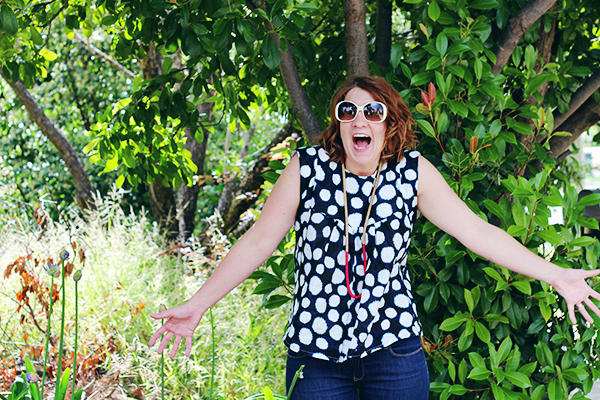 We can totally chain stalk other bloggers’ style! teehee! I’m so jealous that you can sew and wear summery garments. I love both tops but, like you, I prefer fitted things on my upper body. I should follow your lead and step out of my comfort zone once in a while. Totally rad tops! Oooh I can’t pick which is my favourite! They’re both super cute on you. Love it, not sure why I haven’t seen this about! Um, these look FANTASTIC on you. Make 13 more!!! Also, FLUORO DOTS YES YES YES YES YES! All of the fluoro!!!! It makes everything sassy! I just need one of these in my wardrobe! The neon dots are awesome! Love the pattern and it looks amazing on you! Nat, these are such rad summer tops. I say rock one out! Lady, this silhouette REALLY SUITS YOU! Seriously! I love the wingaling sleeves. Such a clever design feature. I will have to look into the sizing on this and how easy it is to size up. It’s really cute. I can do cute! I’m with you on the dress version though. Nuh uh. Can anyone say Sussan’s nightie from 1978? Mmmm double gauze! I’ve had really varied results from Spotto but their lawns always hit the spot for cute summer wear. Trademark infringement and not acknowledging source material is not cool! Also, this is such a cute summer make. The pieces are really simple so it should be easy to size up. Give it a summer bash!!! the way you styled these, with that uber cool necklace, is perfection. gives them an edge with just one strand! It’s my sassy summer necklace for 2014! Who can say no to crazy pink?! Thanks, Amy! I was totally meh about this too until I saw Rachel’s version. Love those lightbulb moments! I am in love!!! Simply amazing!